SCHOFIELD BARRACKS, HAWAII (Jan. 5, 2016) – Picture a hot summer day in Afghanistan, and a company of 25th Infantry Division Soldiers preparing to move to a new area of operation. Instead of using their legs and backs, these Soldiers are fortunate enough to have a small robot to help them on the battlefield. It could provide intelligence, surveillance and reconnaissance without putting Soldiers in harm’s way. 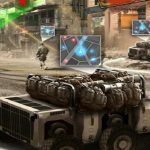 Technology like this can be the future of the battlefield and 25th Infantry Division Soldiers are testing this theory. 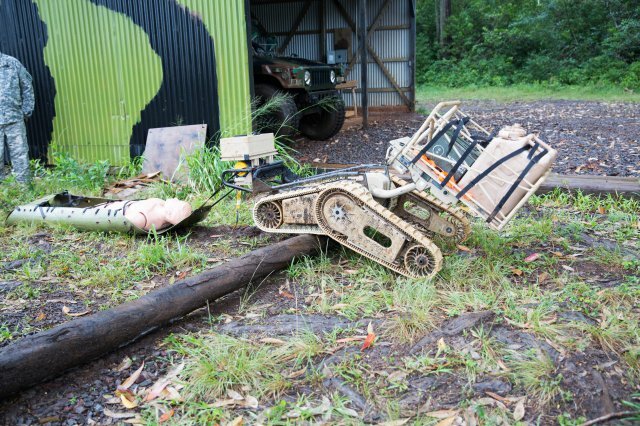 “This training event has been an exercise to address the basis of issue for Soldier multi-use equipment transport robots in the Pacific region,” said Joseph Alexander, Tank Automotive Research, Development and Engineer Center, or TARDEC, representative. 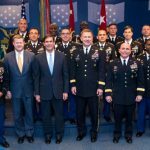 Working with the Tropic Lightning Soldiers first hand is how Army research labs could extend the reach and capability of a platoon or company. “Robotics have a very important place in the future of modern warfare. 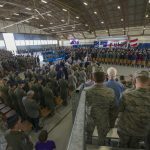 We want to keep the Soldiers out of harms way, especially when it comes to mundane activities, and a machine with intelligence or operated with a man in the loop may keep them safe,” Alexander said. According to a U.S. Army Research, Development and Engineering Command, or RDECOM, article, U.S. Army science and technology advisors initiated this project to field robots capable of assessing chemical, biological, radiological, nuclear, explosives, or CBRNE, threats from a safe distance. Additionally, the robots caught the eye of a group of combat medics with their ability to evacuate a casualty out of harm’s way during a simulation. “When you’re carrying a casualty with a Skedco [plastic sled], two guys are out of the fight. Having a robot we will have an effective fire team in the fight,” said Sgt. Michael Murphy, 1st Battalion, 27 Infantry Regiment. “This would be extremely helpful on the battlefield. The number one thing would be fire superiority and not sustaining any additional casualties,” Murphy added. Freedom of maneuver is also a goal of this technology. This idea involves equipment taken out of a rucksack and mounted on a robot with the ability to move through a jungle environment. “We have to give Soldier and Army leadership a level of comfort when using autonomous technology. 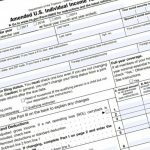 This is the simple form of this technology. 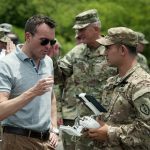 We are hoping to gradually increase that capability, as Soldiers become more comfortable when using robots,” said Drew Downing, RDECOM science advisor to U.S. Army Pacific. Working hand-in-hand with Soldiers and using tactics, techniques and procedures is the formula used to understand how Soldiers will use the technology in the future. 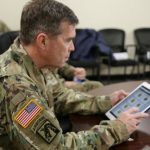 “Soldiers are very creative or innovative, and they will find ways to use it, but we help them find that out in a controlled environment,” Downing said.